The successful deployment of Scytl Online Voting technology allowed members of the Municipal Institute of Persons with Disabilities (IMPD) to vote independently and with full privacy for the first time ever. The uptake of the online voting channel proved highly successful in the community with 47% of voters using the online voting channel versus traditional paper and postal channels. "It is extremely important for persons with disabilities to be able to vote independently and not need to physically go to a polling site." For the first time in the organization's history, the Municipal Institute of Persons with Disabilities (IMPD) implemented online voting as a complimentary channel for their IMPD 2016 elections. Scytl technology enabled members to vote independently and with full privacy for the first time ever in the election of their representatives. The uptake of the online voting channel proved highly successful in the community with 47% of voters using the online voting channel versus traditional paper and postal channels. 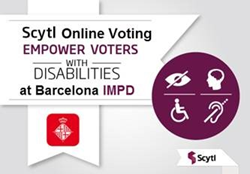 As part of the initiative to help promote citizen engagement and participation, the IMPD – part of the Barcelona City Council - provided online voting as a new and complementary voting channel for persons with disabilities living in Barcelona. The IMPD 2016 election allowed persons with disabilities in Barcelona to vote via the Internet to elect their representatives on the IMPD Governing Council. Five elections took place in parallel, one for each type of disability (visually impaired, hearing impaired, physically impaired, mentally disorder impaired and intelligence disability). As part of the effort to ensure participation and privacy, traditional voting channels were complimented with the new online channel. During a full month – May 23 to June 23 - advanced voting allowed citizens with disabilities to vote by mail or via the internet from the device of their choice (tablets, laptops, smartphones, etc.) at a time and date that was convenient for them. In addition to voting remotely, citizens had the option to vote onsite and with guidance from election staff at one of the 12 voting points set up throughout the city. On Election Day, members were able to cast their vote onsite by means of paper ballots. The online voting platform was tested by visually impaired citizens as well as physically impaired citizens to help ensure full accessibility functionality, making the voting process easier for voters, especially for those using screen readers and Braille credentials and voting information for the visually impaired.